Hello, I currently am running a pair of Infinity Kappa 9s with 2 Tfm-25 in bi amp mode. 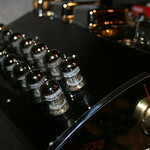 One of the amps has been rebuilt by Rolland and the whole system sounds great. I was wondering if I was to move up to a different amp which one would It be. I was thinking maybe a pair of Silver 9t, bi amp a pair of tfm-45 or 55s or maybe Sunfire. I am not planning on doing anything soon maybe in the next 2 years or so. I am using a really small parasound pre amp that sounds great but the choices I was considering for pre amps was the Sunfire tube pre, Mcintosh c-15 or a Vincent hybrid tube. I really like the sonic signature of the tfm-25s. I tried hooking my A500x to the 9s and didn't like the way they sounded on them. Those are connected to my Infinity 8.1s which are completely different and sound nice on those. I have read threads in different forums that use all of these amps. Any suggestions are appreciated. A couple pics. I've got a really nice Sunfire 625x2 for sale that I bet would sound really nice with those..
jjptkd wrote: I've got a really nice Sunfire 625x2 for sale that I bet would sound really nice with those..
That is one nice amp! It would upgrade most systems I've seen or heard!!! I never had any complaints running 9T's with big Martin Logan's. Those are also pretty demanding. Love the round metered Carvers! Thanks for the photo's! That's a really nice one. I am sure I couldn't afford it right at the moment. lol. You will never ever be disappointed with a sunfire. Long time no see Angelo! Lightstar....anything less is 2 Dixie cups and a string. Second best would be one of the big Sunfire amps. I'm just curious...is that the amp I bought from you? It is one sweet piece of Sunfire gear and sound incredible! If you did go ahead and upgrade your preamp you just might get more mileage out of your TFM-25's. I bet you preamp gets close to clipping before you TFM-25 can open up and sing. Yep, same amp. I really hated to give that thing up best sounding Sunfire amp IMO.